UNITED NATIONS, Sep 20 2013 (IPS) - The United Nations is considered one of the world’s most secular institutions, with 193 member states representing peoples of different faiths and cultures and professing religious and agnostic beliefs. Still, faith-based organisations (FBOs) continue to play a vital role in a wide range of issues on the U.N.’s political, social and economic agenda, including human rights, population, food, health, education, children, peacekeeping, disarmament and refugees. The U.N. Population Fund (UNFPA) is perhaps the only U.N. agency that has invested – heavily and systematically since 2002 – in setting up a Global Interfaith Network of over 500 non-governmental organisations (NGOs) reaching out to disenfranchised communities worldwide. These NGOs include World Vision, Islamic Relief, Caritas, the World Council of Churches, the Young Women’s Christian Association and CAFOD, the official Catholic aid agency for England and Wales. 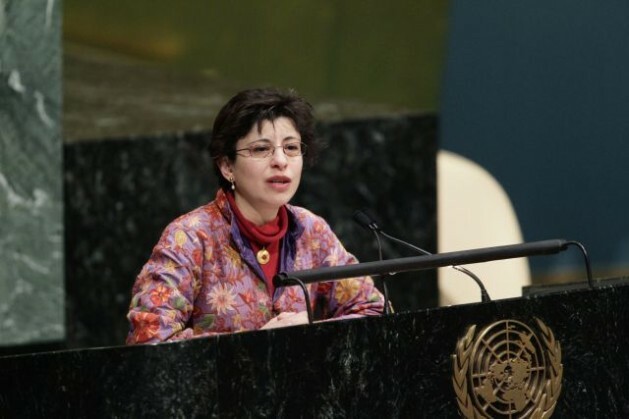 In an interview with IPS, Dr. Azza Karam, senior advisor on culture at UNFPA, said the reality is that FBOs are among the oldest social and economic service providers. They are not newcomers into development services – since this has been among the most traditional modus operandi of any religious institution, she said. “In other words, when it comes to social services – especially but not only in areas of humanitarian relief, health and education – it is the U.N. and the international development and relief agencies, as we know them today, who are the relative ‘newcomers’,” said Karam, a former senior policy advisor at the U.N. Development Programme’s (UNDP) Regional Bureau of Arab States and who holds a PhD in Environmental Sciences from the University of Amsterdam. Q: How effective are FBOs, specifically in Muslim and Catholic countries where women’s reproductive rights are under siege? A: It depends on how we define “effective”. They are providers of basic health care – which includes sexual and reproductive health services – in most of the world, including Catholic and Muslim countries. So if the effectiveness is a matter of providing those basic services, they can be the only such service providers in some poor communities. If, on the other hand, we gauge effectiveness as a matter of advocating for more controversial family planning services – e.g. modern contraception – to be juxtaposed against other forms of “natural contraception” – then these FBOs will vary literally from community to community, let alone nation to nation, depending on a number of diverse factors. These factors include the social and cultural contexts, the types, relationships and diversity between religious leaders and communities, the legal frameworks available and their implementation rate or lack of, among others. Q: How enduring are the services provided by FBOs? A: If we look at their provision of health services in contexts of conflict or humanitarian disaster, many FBOs have been providing basic needs and serve as the first port of call for these needs before, during and long after the “emergency” strikes. Many of the international actors come in during these complex humanitarian emergencies and provide critical life-saving measures. And eventually, many will leave. The FBOs rarely ever ‘leave’, for they are often in the communities, of the communities and formed by the very communities they serve. Q: What could be the contribution of FBOs, if any, to the U.N,’s post-2015 development agenda and the proposed Sustainable Development Goals (SDGs) currently under discussion? A: Many FBOs have been involved – and continue to be very active – in the various fora the U.N. has provided for civil society organisations around the post-2015 agenda and the SDGs. In fact, UNFPA, as the coordinator of the U.N. Inter-Agency Task Force for Engaging FBOs in Development, was requested by the U.N. Development Group (UNDG) to convene a number of U.N. partner FBOs in early 2012. The purpose was to discuss their roles, perspectives and potential and actual contributions to the debates and issues and initiatives around post-2015 processes. Over 30 international FBOs attended the consultation and many of them continue to be engaged in a myriad of platforms and initiatives. Q: What are these platforms and initiatives? A: Many FBOs are part of the various outreach and advocacy efforts within their huge constituencies to inform about the U.N.’s processes, and to gather the voices of their faith institutions and communities, to communicate the varied insights, needs, and priorities from and to the wider U.N. community of policy makers. Several FBOs are also actively lobbying their own national governments on the developmental priorities they deem critical, and the developmental goals their experience of service help them identify. Many have produced research, information and analytical as well as position papers, hosted various debates and fora and even undertaken campaigns led by their various youth and women’s networks to make the case for the issues they are advocating for. Q: How significant are these initiatives? A: Significant advocacy by FBOs is taking place both with national governments and in U.N., intergovernmental and with civil society circles, to secure realistic goals and hold policy makers accountable on a number of issues, particularly around climate change, poverty, inequality, and good governance. Some of their voices are unrelenting in requesting ‘zero tolerance’ of ‘low-level ambitions’ and demanding that U.N. members states tackle politically difficult issues – including in and around climate change considerations, financing of the post-2015 development agenda, corruption and fraud, tracking of global goals, and proposing means of rendering governmental and intergovernmental institutions transparent and accountable.